We’d love your help. Let us know what’s wrong with this preview of Mom Made Us Write This In The Summer by Ali Maier. A sister and brother, forced to write in the summer, and share ONE journal? Ugh. This is exactly what happens to 10-year-old twins Maggie and Max Pruitt. When Mom comes up with a plan for them to keep a summer journal, Maggie and Max can’t believe it. Worse yet, they have to share! Through their writing, Maggie and Max find out they have very different (and hilarious) views A sister and brother, forced to write in the summer, and share ONE journal? Ugh. To ask other readers questions about Mom Made Us Write This In The Summer, please sign up. How do kids want to spend their summer vacation? Not doing homework, that's for sure. This story was told through journal entries between a brother and sister, Max and Maggie. They were forced to write during the summer by their mother to make them get along. This book was absolutely cute and entertaining, and I found myself having a lot of fun with it. What I loved best about this book was the creativity of the journals. Max and Maggie each had their own writing style. It made it easier to recog How do kids want to spend their summer vacation? Not doing homework, that's for sure. This story was told through journal entries between a brother and sister, Max and Maggie. They were forced to write during the summer by their mother to make them get along. This book was absolutely cute and entertaining, and I found myself having a lot of fun with it. What I loved best about this book was the creativity of the journals. Max and Maggie each had their own writing style. It made it easier to recognize whose journal entry was being read. All the journals had doodles that made it visually pleasing and fun to look at, which showed the different personalities of each child. It was very interesting to read how Max and Maggie had different perspectives to the same situations. It was hilarious and amusing to read their point of views. The creativity added to the entertainment of the book. Max and Maggie were realistic. They each had fears and quirks as well as strengths. Though they were twins, their personalities were not the same. Max was the sporty boy who loved to shoot things and enjoyed anything that was gross. Maggie was the fashionable one who loved to go clothes shopping and loved cute animals, but hated babies. It was fun to read the kinds of topics that each sibling picked and it was enjoyable to read the comments that they made to each other. Max and Maggie sounded like two realistic siblings who bickered yet loved each other. Maggie and Max are twins and their mother has given them a journal to write in over the summer. She gives them some basic rules and some ideas about what to write on. They each get to choose topics and both of them have to write something about each one. They can comment on the other person's entries, but must be polite. There are twelve different topics and it was fun to read what they wrote. My daughter read this the first day it came and loved it! It took me a while to get to it and when I did Maggie and Max are twins and their mother has given them a journal to write in over the summer. She gives them some basic rules and some ideas about what to write on. They each get to choose topics and both of them have to write something about each one. They can comment on the other person's entries, but must be polite. There are twelve different topics and it was fun to read what they wrote. My daughter read this the first day it came and loved it! It took me a while to get to it and when I did, we read it together, with her reading Maggie's entries and comments while I read Max's entries and comments. This book was entertaining from beginning to end. Some of their topics were the zoo, icky babies, baseball, Ice Cream Day (my daughter seriously loved this idea! ), hotels and back to school. They teased each other but also showed that they cared about each other. The author does offer a shared journal which I'm planning to get--my daughter will love it and my son will hate it, haha. This is such a creative book which can help children gain the desire to keep a journal of their own. If you're looking something for your kids to do this summer, this is a fantastic idea! Mom Made Us Write This In The Summer is a wonderful journal style book that focuses on a brother and a sister who happened to be twins. The story started off with them having to write twelve entries in a journal throughout the summer as a form of punishment for not behaving well. Neither one of them are excited about this assignment at first. Initially, they argued a lot, with a lot of blame being tossed about. As the story progresses, I begin to see how the twins come to understand and apprecia Mom Made Us Write This In The Summer is a wonderful journal style book that focuses on a brother and a sister who happened to be twins. The story started off with them having to write twelve entries in a journal throughout the summer as a form of punishment for not behaving well. Neither one of them are excited about this assignment at first. Initially, they argued a lot, with a lot of blame being tossed about. As the story progresses, I begin to see how the twins come to understand and appreciate each other better. I loved how the characters grew over the course of the twelve entries. I really enjoyed reading this book. The format of this book is clever because of the switching viewpoints which allow readers to hear from two different perspectives. This format allows me to get to know the characters' personality better and it helps me to connect with them more through the journal that they shared. Ten-year-old twins, Maggie and Max, are enjoying their summer holidays until they get into one too many noisy arguments. Mom, who works at home, has had enough. In order to encourage understanding and respect towards each other, she tells them they must keep a joint journal of twelve entries. Each child must initiate six topics and the other must respond in the journal. Pictures are allowed (and are hilarious). Maier has tremendous insight into the 10-year-old mind, both male and female. Each chi Ten-year-old twins, Maggie and Max, are enjoying their summer holidays until they get into one too many noisy arguments. Mom, who works at home, has had enough. In order to encourage understanding and respect towards each other, she tells them they must keep a joint journal of twelve entries. Each child must initiate six topics and the other must respond in the journal. Pictures are allowed (and are hilarious). Maier has tremendous insight into the 10-year-old mind, both male and female. Each child has fears and strengths. Both experienced frustration understanding the point of view of their sibling, but by the end of the summer have gained insights and, hopefully, empathy toward their twin. The book is not preachy and there is no great, dramatic incident, but it is an enjoyable read. The children are forthright and funny. Several incidents and illustrations are sure to make the reader laugh out loud. It is realistic, believable, and highly relatable. Even adults will find themselves nodding at similar experiences. Because the book is peppered with charming doodles, done by the children, it may be difficult to share with a large group. However, I think it would make a wonderful book for a parent to read to their children, especially those that conflict over the summer. They may even choose to have their children emulate Maggie and Max and write their own journal. The author has cleverly provided a journal for purchase that would suit this activity. I wonder if the idea might be adopted in a different way, a journal between a parent and child, especially a child of divorced parents one of who lives a distance away. It could also be used by a parent who is working or serving in the military far away. An online journal, with a limited number of entries, might provide an experience for connection. This amusing book subtly increases the reader's perception of others while providing a highly entertaining read. Highly recommended. Have you ever seen pictures on Pinterest or Facebook with two kids held together by a large t-shirt and on the front it is written “This is our get along shirt.” Well, I have no idea if that works or not. What this Mom did seems a little more creative and effective. When ten year old twins, Max and Maggie, completed fourth grade and were settled in for the summer, they began to squabble. So, Mom bought a journal. Maggie actually likes stuff like that so she thought Mom bought the journal for her Have you ever seen pictures on Pinterest or Facebook with two kids held together by a large t-shirt and on the front it is written “This is our get along shirt.” Well, I have no idea if that works or not. What this Mom did seems a little more creative and effective. When ten year old twins, Max and Maggie, completed fourth grade and were settled in for the summer, they began to squabble. So, Mom bought a journal. Maggie actually likes stuff like that so she thought Mom bought the journal for her. But, oh no, it was for Max and Maggie to share during the summer. Mom wrote the first two pages of the journal. Some of the rules included that they take turns choosing a topic. Whoever chooses the topic writes first. They both must write about the same topic. They can make comments on each other’s writing, but they must be polite. Then she made a page of topic ideas. Mom Made Us Write This in the Summer is a fun journal style book that focuses on a brother and sister who happened to be twins. When Maggie and Max keep fighting their mother decides to give them summer homework in the form of a journal. They have to pick 10 topics and then they both have to write how they feel about that topic, and through the course of the summer they learn how to appreciate each other. I love journal books like this, probably because I never wrote in a journal as a kid. It’s a Mom Made Us Write This in the Summer is a fun journal style book that focuses on a brother and sister who happened to be twins. When Maggie and Max keep fighting their mother decides to give them summer homework in the form of a journal. They have to pick 10 topics and then they both have to write how they feel about that topic, and through the course of the summer they learn how to appreciate each other. I love journal books like this, probably because I never wrote in a journal as a kid. It’s always fun to read a story and then have the main characters include pictures and scribbles, it really brings out the character’s depth and helps you connect with them more. Maggie and Max have great personalities that will definitely hit home with a lot of kids their age (10). Maggie is a great example of a strong girl, who enjoys drawing and a ton of ice cream. She’s got a great head on her shoulders, though sometimes she’s prone to over-reacting. Max is a smart kid with a knack for building shotting devices out of paperclips and rubber bands and loves sports, but as his sister puts it he’s sort of ‘clueless’ when it comes ot other people’s feelings. I loved seeing how Max and Maggie grew over the course of the 10 entries. At first they are argumentative, even in written form, with a lot of blame being tossed about and a lot of frustration but as they story progresses you begin to see how they comes to understand each other a bit better and start seeing how much they actually have in common. This is a really fun book, I would say for children ages 8-12 especially for those who have siblings. This story is about Max and Maggie, 10 year old twins, who have just broken up for the summer holidays and mum has bought them a journal to write in and make sure they get along. They are required to share the journal and write in about their summer holiday, so this is written in journal format. I really loved the format of the book and it really made it fun and interesting to read, the font ins This is a really fun book, I would say for children ages 8-12 especially for those who have siblings. This story is about Max and Maggie, 10 year old twins, who have just broken up for the summer holidays and mum has bought them a journal to write in and make sure they get along. They are required to share the journal and write in about their summer holiday, so this is written in journal format. I really loved the format of the book and it really made it fun and interesting to read, the font inside is slightly different depending on who is doing the writing so it makes it really clear to follow and understand. I also loved all the scribbling inside, of pictures or enlarged letters, this really gave it the feel of being a journal and something that they children love to write in. I really loved this book, although I am slightly older than 12! It is brilliant for children as it covers bickering and squabbling with a sibling, it helps them understand the thoughts that perhaps the other is having.Both Max and Maggie find it frustrating that they have to understand the others point of view, however they over come it. I really liked the style of this book and I think it will prove to be extremely popular. Especially for long car journeys in the summer or on a plane trip. As an adult you will also enjoy it, remembering childhood memories that you may have had with your own sibling, and the doodles in the book are sure to make you giggle. Max and Maggie, ten year old twins, find out to their surprise that they are required to write a summer journal on their time off.... and together! What? You've got to be kidding! Mom has laid out an extensive plan to have both the kids record 12 entries in that journal by summer's end. At first there is resistance but as the journey of the journal unfolds and the twins navigate the daily trials of their childhood and their differences of opinions on almost everything, they begin to see the valu Max and Maggie, ten year old twins, find out to their surprise that they are required to write a summer journal on their time off.... and together! What? You've got to be kidding! Mom has laid out an extensive plan to have both the kids record 12 entries in that journal by summer's end. At first there is resistance but as the journey of the journal unfolds and the twins navigate the daily trials of their childhood and their differences of opinions on almost everything, they begin to see the value of the lesson mom is trying to teach them. Through their symbiotic writing they gain a better understanding, and yes, even appreciation of not only who they are as a person but who the other sibling is as well. The book is written in a free-style, journalistic format full of funny interjections and fun, humorous, kid-friendly pics. I know kids (and parents) will love this book and who knows? Maybe next summer your own kids will take up the pen and travel through personal diary pages until the school bell sounds and requires them to trade in their homespun journal for teacher-taught, creative writing classes and the dreaded.....homework assignments! When school does beckon them back you can rest assured that their writings skills will be greatly improved because of their summer writing experiences. I highly recommend this book. I love when books for middle grade readers are funny but also teach kids and this was one of those books. A brother and sister have to work together to finish journal entries over the summer in an attempt to get along as well as write during their summer break - both wonderful things. I really enjoyed this book, the idea is wonderful - no planned prompts, just a journal - express yourself but do it with your sibling. It was funny and great. I loved the interaction between the siblings and the do I love when books for middle grade readers are funny but also teach kids and this was one of those books. A brother and sister have to work together to finish journal entries over the summer in an attempt to get along as well as write during their summer break - both wonderful things. I really enjoyed this book, the idea is wonderful - no planned prompts, just a journal - express yourself but do it with your sibling. It was funny and great. I loved the interaction between the siblings and the doodles and notes in each others entries made those bits all the more entertaining. I think a kid reading this will really like it. It appeals to both boys and girls and lots of different likes and dislikes. I (even as an adult) felt connected to both Maggie and Max in different opinions and really liked that. I wasn't really drawn to one or the other but both and that makes for a great story. Mom Made Us Write This In The Summer is a book for children 8-12, but I'm definitely older than 12 and I still enjoyed it! This was such a fun book to read and was surprisingly relate - able. It is written in journal entries by twins Max and Maggie. They share the journal and write about their summer vacation and include little drawings and comments which makes it very realistic. So fun! I enjoyed this charming read about 10 year old twins Max and Maggie who were instructed by their mother to write 12 journal entries over the summer. The two siblings often quarreled, so their mother's hope that their writings would bring a better understanding between the two became the goal. The fresh and unique journal style entries made for a fast paced trip through the thoughts, dreams and plans of the twins. Their varying personalities became apparent through their choice of topics a So fun! I enjoyed this charming read about 10 year old twins Max and Maggie who were instructed by their mother to write 12 journal entries over the summer. The two siblings often quarreled, so their mother's hope that their writings would bring a better understanding between the two became the goal. The fresh and unique journal style entries made for a fast paced trip through the thoughts, dreams and plans of the twins. Their varying personalities became apparent through their choice of topics and each voice of the kids rang true. Sporty Max and Maggie the fashionista styles shone clearly on the pages. Many times the same situation was told by the differing points of view which allowed the reader to connect with both of the children. Each entry had accompanying doodles which added to the reading experience. I think this a funny and very enjoyable read which many of all ages could enjoy! I received a free digital ARC from NetGalley. Some images in my copy were too dark to see. When Maggie and Max keep fighting over summer break, their mom gives them an assignment - to write 12 entries in a journal, together. As they navigate the daily trials of childhood and sibling rivalry, the twins gain a better understanding and appreciation of themselves and one another. This book is very good reading for young siblings around upper elementary or lower middle school. The characters have very I received a free digital ARC from NetGalley. Some images in my copy were too dark to see. This book is very good reading for young siblings around upper elementary or lower middle school. The characters have very distinct personalities that will attract readers of all ages and genders. The writing is punctuated by art and comments that will keep readers interested and laughing. Great read for both kids and parents! This book teaches kids about sibling dynamics, encourages journaling and is extremely relatable for young audiences. What more could you want in a children’s book? The female character, Maggie, is a spunky young girl, the perfect model for young readers who are growing into strong girls. Max, on the other hand, relates to the sense of humor of young boys. There is something for every audience here; Ali Maier even shows Max and Maggie fighting and making up, Great read for both kids and parents! This book teaches kids about sibling dynamics, encourages journaling and is extremely relatable for young audiences. What more could you want in a children’s book? The female character, Maggie, is a spunky young girl, the perfect model for young readers who are growing into strong girls. Max, on the other hand, relates to the sense of humor of young boys. There is something for every audience here; Ali Maier even shows Max and Maggie fighting and making up, emphasizing the importance of having a good friendship with your siblings. Such a good book for children to read or for parents to read with their children! And check out Maier’s ‘Write Your Own Shared Journal’ for kids to document their own day to day activities. Have kids that love to read? 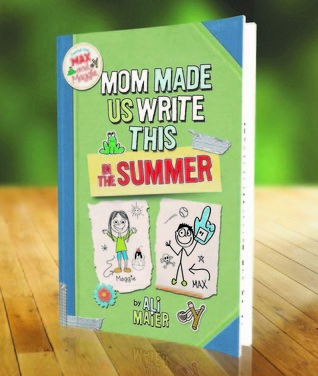 Check out Mom Made Us Write This In The Summer - the new children’s journal book from author Ali Maier. The first, in an upcoming series of adventures in twin-life journaling books, Mom Made Us Write This In The Summer gives readers a he-said, she-said view into the hilarious and adventure filled family life of 10 year old twins. A sister and brother, forced to write in the summer, and share ONE journal? Ugh. This is exactly what happens to 10-year-old twins Have kids that love to read? A sister and brother, forced to write in the summer, and share ONE journal? Ugh. This is exactly what happens to 10-year-old twins Maggie and Max Pruitt. When Mom comes up with a plan for them to keep a summer journal, Maggie and Max can’t believe it. Worse yet, they have to share! This journal style type of book took me back to my classroom days. The days that I would have my students get out their journals and write. Write about life. Write about a topic of choice. Write to a prompt I gave them. Just about anything to get them writing and writing. When book characters engage the reader, it is great. In "Mom Made US Write This in the Summer", you not only get to peek into a 10-year old's journal, but you also get to read the thoughts and feedback from their twin. This way you already know the other's response to a statement that is awaiting a sibling-sized rebuttal. Max and Maggie may not have liked their "assignment", but they took it well and it turned into a fun read. We loved the notes in the margins and the doodles. I liked the ideas When book characters engage the reader, it is great. In "Mom Made US Write This in the Summer", you not only get to peek into a 10-year old's journal, but you also get to read the thoughts and feedback from their twin. This way you already know the other's response to a statement that is awaiting a sibling-sized rebuttal. Max and Maggie may not have liked their "assignment", but they took it well and it turned into a fun read. We loved the notes in the margins and the doodles. I liked the ideas of what my kids can do over the summer and try not to make it feel like homework. Anyone who has a parent who is also a teacher can relate to that. This is a wonderful book for upper Elementary School aged Children. Its written in theform of a journal told by Sister and brother Maggie and Max. The journals are assigned by their Mom over the summer. Neither one of them are to thrilled about this assignment at first. Children will enjoy getting a glimpse into Maggie and Max'es Summer it is written in both a fun and humorous way that both boys and girls will love. I give this book Five out off five stars. I really enjoyed this book. There was something for everyone. I loved the main characters, Max and Maggie, they are both so much fun to read. Maggie is spunky and Max is quite the character. It was a blast getting to know of them through the journal that they shared. It is a look into the lives of kids and a look inside a family, with the fights, sibling rivalry and the love and friendships that makes families GREAT. For fans of DIARY OF A WIMPY KID and DORK DIARIES will eat this book up! Nice to find a book that my kids thought was funny that showed a loving, but imperfect family. The characters, Magie and Max, reminded me of my sister and I as children-but funnier. My children related to the twins antics as well. A great read. I really enjoyed the characters ,It feels like you are right there next to them. Loved every minute every word and every literary device used in this book. This is a work of fiction and it's fantastic. It's a great read and it promotes a healthy sibling relationship. I honestly think this is something that parents should actually do!